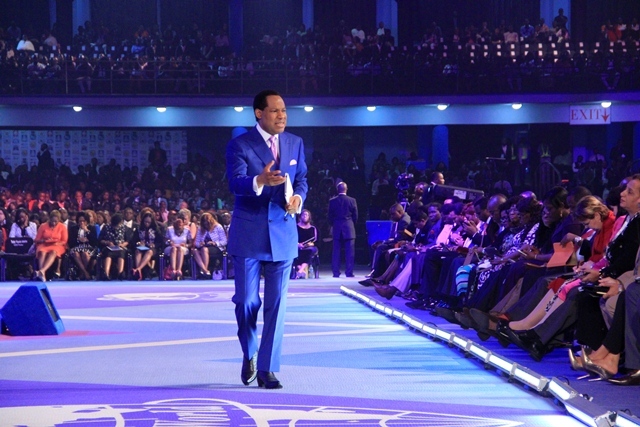 The last session of the Pastor’s Conference Wednesday morning had Pastor Chris Oyakhilome admonishing delegates of the importance of changing their minds with the word of God. He delved deeper into the importance of grace in the life of a Christian and how to attract God’s grace. He also spoke about taking decisions to be relevant in the house of God. As delegates prepare for the Partners Conference coming on in the evening, the clarion call by Pastor Chris kept reechoing in their spirits. Pastor Chris taught on the importance of working the word of God and taking action along their calling as Christians. Pastor Chris started with a story of how some translations will come up to corruption the Bible but insisting that irrespective of what happens, the foundation of the Bible is quite sure. “When there were no more copies of the Old Testament, men memorized them word for word. The story of the man that memorized the bible and asked his hearers after reciting the entire New Testament if they also wanted the punctuations”. Pastor referenced several scriptures to buttress the importance of grace in a man’s life. Using Apostle Paul as example of a man that had a special grace bestowed upon him, he read from 1 Peter 5:5,he enunciated on the fact that God gives grace to the humble and resist the proud. God gives more grace to the humble and according to calling. Also reading from James 4:6, God giveth more grace to the humble. He resists the proud. Romans 12:3, Paul was talking about the grace given to him. The same measure of faith is given to us when we are saved, but, we need to grow in grace, in faith and in love. Romans 15:15-16, the grace that’s given to me from God to be minister of God to the Gentiles. This grace was specific to his calling. Ephesians 3:8, the grace enabled him to bring the unsearchable riches of Christ. Pastor warned delegates not to allow others to make them ashamed in life. “You must distinguish yourself if you want to shine. You must be different”. Reemphasizing the point that needed to be made, Pastor Chris said that “for many years, you couldn’t stay with me without changing. Either you stay or you’ll run away. You can’t have it both ways. These are important things. We’ve heard so much”. Adding that “one day, you were 10, 15, and 20 years…. Act now, you’ll soon be 70. Don’t delay. Act now. You have heard some of the preachers who are loaded with inspiration and power with result. I send people from campus to Amsterdam to take over the city, trained and seasoned people”. Pastor noted that “we’re not just trying to share things because we are just gathered. We’re proving the word of God. Ditch your earthly culture for that of God. You have to be recultured by the word. Paul said that I was a Jew. He had earlier said I’m a Jew. He was a new man in Christ. He had burnt his bridges. (2 Corinthians 8:7-11). Continuing, Pastor said that faith, utterance, knowledge, diligence and love, noting that “you can have all of these and still be broke. There’s grace. God doesn’t fund things He didn’t call for. Abound in grace also. Prove the sincerity of your love. Though Jesus was rich, He became poor for your sake. This is the grace. Perform the doing of it. Why didn’t you complete it? You need grace to give, not to receive he added. Continuing, he said that “for how long will you wrestle with the Holy Ghost to give. You shouldn’t think about giving God big things. Thinking doesn’t bring miracles. There are certain things your mind can do for you. In the realms of the spirit, your mind cannot help you”. Pastor is our father, but, he’s also a general. We’re soldiers in God’s army. Jesus is the Lord of our lives; He is more than our Father. A disciplined soldier does not break ranks. We always say special thank you to our man of God…. I’m the pastor here, not you. Up there, there’s an angel there. Guardian angel. I’m not the only one that sees him. (2 Corinthians 9:6-10). Sow and reap sparingly or bountifully, he said, it is spiritual law. Is what you’re giving big to you in the first place? Give to God as God, not a man he admonished. He gave example of the Europeans whom he said sowed sparingly and reaped sparingly. That is why God gives them leaders that tax them heavily. Their governments are always taking. To break away, you have to give. Look at their gifts. Toys and stuff. When you come out of that place, you see things differently. Do you want to have more, he asked? The law of faith and that of sowing and reaping are from God. Farmers release their faith in their seed. Yes, you’re willing, now, perform. Believing doesn’t bring salvation. You must confess with your mouth. By your word, you’re condemned or saved. The doing of God’s word bring blessing. God is able. He’s able to make all grace abound towards you. Where did the fish come from, he asked? He directed them. He can direct the money to you. Our God is powerful. Make no mistake about it. God packaged His blessings through the comforts of the scriptures to you. Through comforts of the scriptures we have hope. How can I call for such a conference and expect you to come. It’s not because I can do something to you. It’s because when I open the bible, it talks to me. He knows that we don’t see Him every day. He gave us the scriptures to rely on. It makes us wise and to deal wisely in the affairs of life. It’s for our life. I’ll always be successful. My love for Jesus Christ is enough propellant. Love can’t go to hell. Hell can’t take me. They will reject me. Love is more than words. I love Jesus more than life. That’s what I want to transfer to you. Heaven is about Jesus. Nothing more. Fall in love with Him. Let it be your meditation. (Colossians 3:1-4) Set your affection on things above. Focus your thinking constantly on Him. Your mind will direct your affections. You can direct your life by the power of your mind. From that thing to this one. Pastors book is coming out soon. Marvelous book for the old and the young. It deals with the mind. You’re where you are today through the processes of the mind. When Christ, Who is my life shall appear… Christ is my life. There are things you do that demons will multiply around you. They can multiply needs to keep you chained. They don’t want you to break the hedge God built around you. God doesn’t break hedges. Job broke it and Satan was ruthless. We can talk to the devil eyeball to eyeball. Jesus told God, I know you hear me always…. There are things the Father already knows, sees and hears that you don’t need to complain to Him about. Take with you words, confessions of faith. The blessings of the Lord maketh rich and adds no sorrow. He makes all grace abound towards you. Every Favour and earthly blessings to you… You will be self sufficient… Requiring no aid or support. It’s a choice. You make a choice to go into that grace. Where do you want to be talking from? Can you be available? There’s so much that needs to be done. Your mind shouldn’t be on any man to help you. The blessings of the righteous that exalts a city. What’s gonna happen because of you? What’s your next big seed going to be? Can your faith do it? You don’t measure a man by what he has. You measure the value of a man by what he gives. Are you on a journey of greatness or have you arrived? Pastor hinted on some new products to expect from the Ministry such as Infinity card, Loveworld Mobile Online Payment platform and Loveworld Wallet. The Pastor’s Conference ended on a very great note as delegates prepare for the Partners Conference starting Wednesday evening. Thank you, Sir. I will not wrestle with the holy ghost to give. I am a prompt to do it giver. Jesus is the centre of it all! Thank u so much for this write-ups….it’s encapsulates everything that Pastor taught.